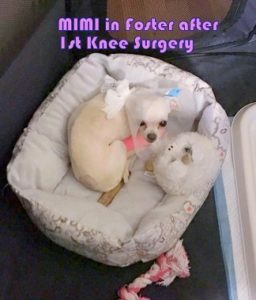 First UPDATE on MIMI’s Progress: MIMI left the specialty hospital after her 2/7 spay & surgery to fix the Grade 4 luxated patella in her left knee. She is back in Last Hope foster care. MIMI is doing well, being weaned off pain meds and looks like a princess in her cushy bed. MIMI will recover from 8 to 12 weeks before Dr. Lesser corrects her right knee. After the next recovery, she will be getting PT to strengthen both new knees. MIMI is no more than 2 years old & came into Brookhaven Town Shelter in January as a frightened stray, supposedly found in Mastic Beach by a Good Samaritan. How could this tiny dog run away or fend for herself? She has such a hard time walking. Both of her back legs were bowed outward, and she walks down on her haunches like a frog.. The complex operations are quite expensive. 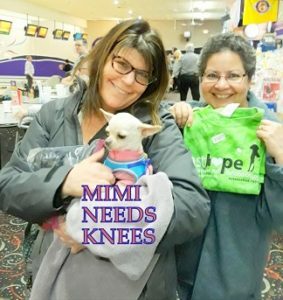 We raised several thousand $ at our Bowlathon for MIMI’s KNEES, but have a way to go to meet our goal. Last Hope overwhelmed by the kind people contributing to her care. We are overwhelmed by the kind people contributing to her care. donate via Last Hope’s Pay Pal on the www.lasthopeanimalrescue website homepage here with a note “For Mimi”. MIMI is so GRATEFUL for all her many friends have done for her! This entry was posted in Home notification, News. Bookmark the permalink.